After reading Knox’s statement, “We did not expect crossbows to be the perfect solution to solve our deer problems in the urban areas— “, we can all safely assume that this cool weapon is really helpful to hunters. This might or might not come as a surprise but all the hunters do not agree upon the use of a hunting crossbow. Usually the people belonging to traditional archery groups have clearly opposed the idea, every time the topic has come up during hunt camps and other gatherings. United Bowhunters of Pensylvannia argued in a circulated memo that allowing hunters to use the deer hunting crossbow can double the number of bodies in the woods, which could lead to additional pressure on the already oh-so-crowded public hunting places. However, the state wildlife agencies want to put more hunters in the woods to push up their license sales and keep the hunters from leaving. Only a year after the hunting crossbows were legalized, in 2006, this modernized form of the weapon helped bag 2.5% of Virginia’s total deer harvest. While, it accounted to 20% of the total harvest made through archery. So, now we have come to know that over the years, bow hunters are steadily declining in number and, in turn, the crossbow hunters are increasing. Why are Crossbows Getting So Popular? A hunting weapon that can be effectively used by all after a few tries, who can say no to that? In all seriousness, bow hunting is a much harder skill and anyone wanting to just go out there and hunt some game, cannot do it right off the bat. This is why, the cool hunting crossbows have helped attract many people into the sport of hunting, those people that did not even thought of hunting in their lives ever before. 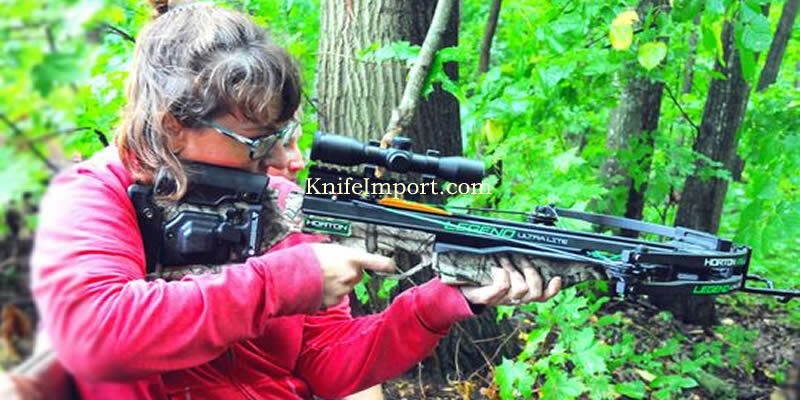 Knife Import receives many orders from its customers for crossbows for sale and personal use on regular basis. You can also try to get the best crossbow of the year with its set of bolts (arrows) at cheap prices from the platform. It’s a great place to find all products that you might need on your expedition such as survival blades, hunting knives and a complete set of blades, for different but specific purposes while hunting and after. How Does a Crossbow Work? Basically, the weapon mechanism is simple, as it’s just a bow attached to a trigger over a supporting structure that has a groove for a bolt and allows the bowstring to be locked in place, which is released when the trigger is pressed. In medieval times, the crossbows were made out of wooden supports and weren’t secure enough as compared to today’s hunting crossbow for sale available in the market. Why? Because the lock or lever could be triggered into releasing the bolt by the wielder’s mistake. The other major part of this weapon is the crossbow bolts. The reason, as to why the projectiles used in this bow and string mechanism are called bolts and not arrows, is that they don’t have fletching or the feathered ends we find on common arrows. Another important thing to know about bolts is that they are much heavier than a normal bow’s arrow and quite smaller in size. This helps the crossbow bolts to achieve the maximum kinetic energy possible. In case the weight of a bolt is off, even slightly, a crossbow target practice can be rendered useless then how can we talk about using it during the hunt. To avoid such problems, modern day bolts are stamped with a proof mark to guarantee their consistent weight. In its early days of use, the Chinese used steel or bronze metal sights to lock-on to their targets. However, thanks to the latest technologies, the red dot scopes or telescopic sights are being used in the modified cool crossbows of today. The modern day sights not only help the shooter gauge their target but provide extra information such as what effect will gravity have on the projectile etc. It’s a crossbow accessory that is much needed nowadays and this is why it comes with the weapon, sometimes even with a toy crossbow. As any gun or rifle, the crossbow is nothing but a mechanism to shoot out a projectile. Observing its effectiveness people made variations to the weapon to make it small sized pistol crossbows or even large enough to send rocks flying into the far off distance. Some ancient crossbows had double or even triple mounted bows, while some had the ability to shoot multiple bolts at one time. By now, we know one thing for sure that the crossbow was an awesome and yet terrifying weapon utilized for various purposes from a killing machine in wars to a useful hunting tool for hunters. Keep your fingers down (before and while readying yourself to shoot). Point your crossbow in a safe direction (as anyone who gets hit by the bolt gets hurt for sure). Check whether all parts of the weapon are in place, especially the screws because they tend to come loose over time. Keep your weapon lubed up as it will allow you to use the weapon safely in the long term. Load your crossbow while exposing your fingers to the least risk of injury, even stay alert while shooting and when you start the process all over again. This was all from us! However, we think you might just be searching for cheap crossbows for sale in stores around you. So, we will not stop you or hinder your advances. Go on and have fun! Related Article: Basic Uses of a Hunting Knife - Why you need it?